Here are a couple of bathrooms from 1960 and 1961. You know, they're not half bad. There are some elements to them that we still do now. One of them has a separate water closet and I see more than one wall-mounted toilet. 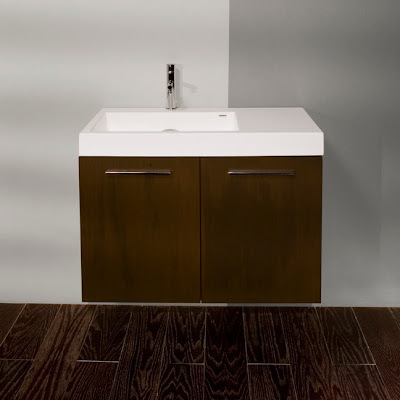 There's 1/2" mosaic tile, furniture-inspired vanities, funky wall paper that's not too funky and a floor tile in the last image that looks suspiciously like terrazzo tile. What's cool now isn't terribly off from what was cool in 1961. See what I mean? If you have a bathroom that dates from the early '60s you might as well keep it. At this stage of the game things have come full-circle and the early '60s are fashionable again. I call it the Mad Men effect. If you can imagine Betty Draper spraying Aqua Net in the mirror, you're good for another five years at least. People didn't really go off the deep end until the latter part of the '60s anyhow. Again, see what I mean? Hot Dr. Pepper? I can't imagine drinking that stuff cold. 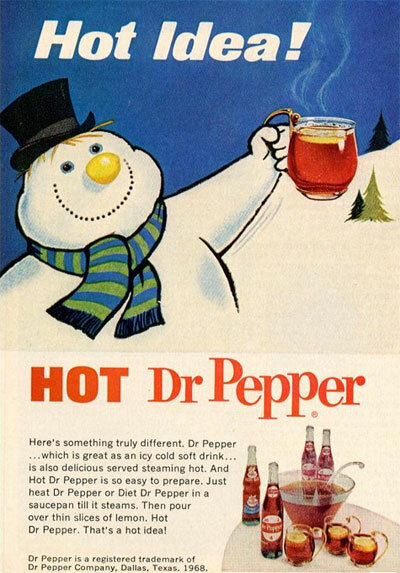 If the ads are to be believed, hot Dr. Pepper was all the rage in 1969. I was four at the time so don't blame me. 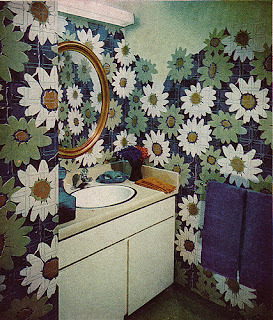 So if everyone was sitting around drinking hot Dr. Pepper in 1969, what on earth did a bathroom look like? Are you sure you want to know? Ugh. See what happens when you drink hot Dr. Pepper? I want a blanket absolution for every aesthetic choice made from 1968 through about 1984. I have no idea what got into people but mercifully, it passed. Despite the attempts to revive them by people too young to remember those years first hand, they are gone for good. 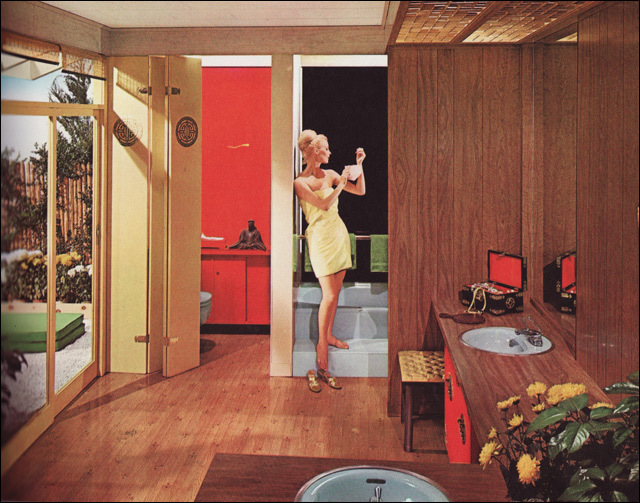 But seriously, a lot of the innovations from the mid-century era are still with us. Remember that blue bathroom from the beginning of this post? 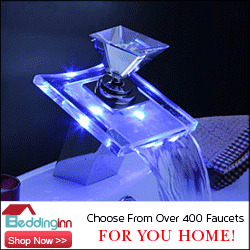 See that sink? Here's its modern incarnation from La Cava. Remember the toilet from from the fifth image? Here's its modern counterpart from Duravit. See? A lot of that stuff is still around. Looking to recreate that nightmare from 1969? You're out of luck. That's just as well, some chapters need to remain closed. So what do you guys think? Did the designers of the time get something right in the early '60s? Or am I just blinded by my fascination with all things Mad Men? Would you recreate one of those vintage looks in your home today? 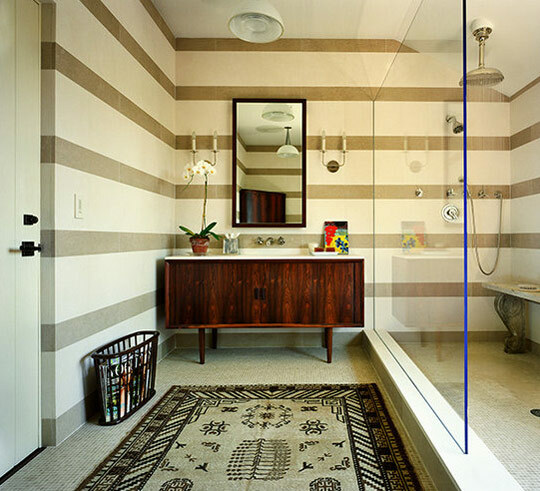 What is it about those mid-century styles that makes them look so appealing today? Paul, you are unbelievable! What a gold mine of ideas and images. Being stuck in the 60s really has become pretty cool -- except for the hot Dr. Pepper. I'm with you on that. 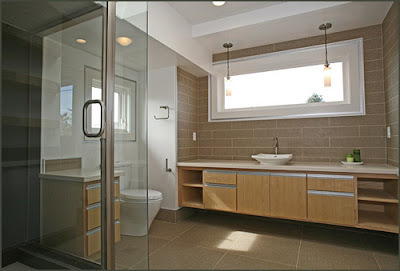 Thanks for being part of Bathroom Blogfest 2010 and adding so much bathroom perspective. Saucy: I am no sociologist, but it would be interesting to track how price beat out value in the latter years of the mid-20th Century. There was a recession in the late 60s and the drumbeat to drop the gold standard was pretty loud during the same time. I wonder if they're related. Anyhow something happened to value during that timeframe and I'd love to know what. CB: Thanks! I'm glad I could participate! Let's play word association. You say, “1960s bathroom concepts;” I say “hand grenade.” That’s the age thing, I suppose. To you, it’s a wonderful throwback to a previous era. 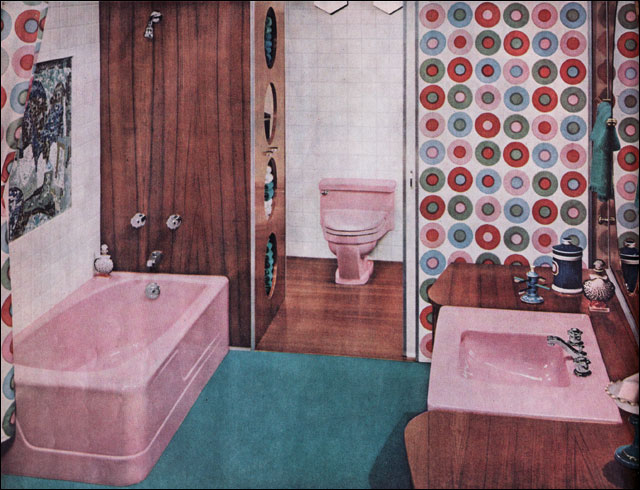 To me, it’s a regurgitation of the bathrooms I grew up with. 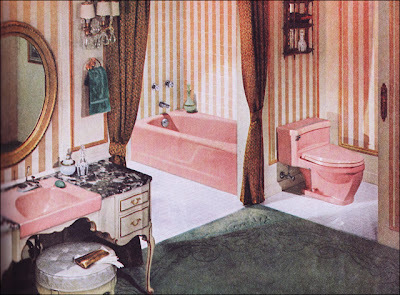 I can remember when my father remodeled the bathroom in our Helena, Montana house in 1960 or 1961. The fixtures he installed were very much like those you show in pictures 3, 4, and 5. Been there, done that. Ha! I think the rule of thumb is that as soon as even most die-hard-stick-in-the-mud members of the generation who first installed the style have finally dumped it, it is guaranteed to become desirable and fashionable for a generation who didn't suffer through it. AND that will apply even to the late 60s and 70s. Mark my words. Raina: Well, since I played a role in some of the aesthetic choices made during the 90s and aughts, I predict that those decades will be looked upon with kindness and admiration. 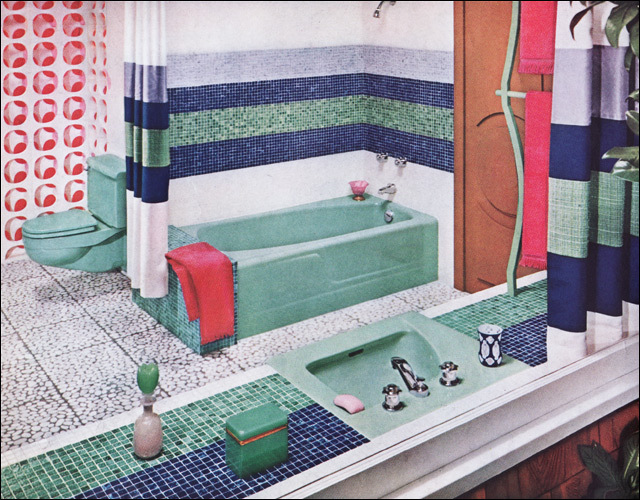 Joseph: The point of my post was not to suggest that people recreate bathrooms from the early '60s. Ugh. I hate retro anything. My point was to point out that so many of the innovations we use today were innovative then too. Sarah: Oh I know that there's a move afoot to resurrect the '70s, the decade of shame. Ugh. What a horror show. Great post. Love the comparisons. Makes me wonder what's up next, the eighties? 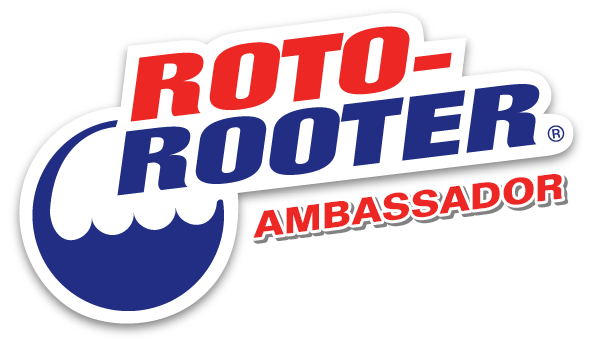 So how does one get in on this groovy blogfest?? Christine Whitmore runs it and you can drop her a line for next year on the fan page. Um, we had a few bathrooms in our house that looked somewhat like these (less coordinated, more mess) and I have no memories (I was pretty young) of them being cool. They were just bathrooms. But in the pictures above, they look rather groovy - okay, pre-groovy. I'd rather bring back the 60's than the 70s. From that era, I don't recall anything that should be resurrected. Not even Famolares. I don't know about you, but I'd like to see a revival of the gaucho. 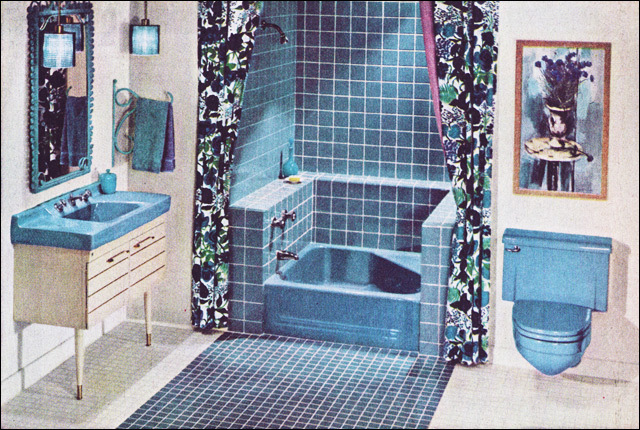 That first blue bathtub - "half bathtub" with a corner built-in seat - we had that in the Kid's Bathroom in the house I grew up in starting in 1955. I think ours was white though. We've got one without the corner seat in our current house. Friends keep begging for one like it. When we go to a "wet room" for geezer accessibility there's gonna be a local fight over my cool bathtub. It was the perfect size for small kids or washing the dog. Still is. 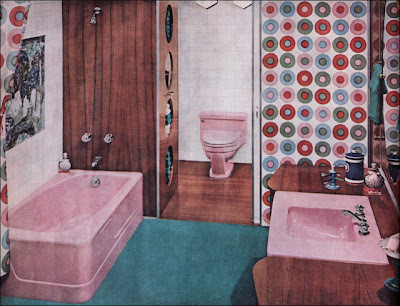 The Grown Up's bath had all pink fixtures, and pink & grey boomerang formica counters. I don't want any of it back! On the other hand, I still own and use my avocado green gas Whirlpool clothes dryer that I bought used in 1972. Works great, but not as well as solar. Faster though. In the last year I've shifted to using it only for laundry emergencies. My pleasure! You know, you ought to take a photo of that dryer and send it to Whirlpool. The love that kind of stuff. Good design works, whether it's now or from the 60s. Funnily enough, I don't mind the daisies in the last picture. However, I find the light fitting, mirror and vanity utterly objectionable.